The principles and teaching methods employed at Express Guitar are based on the training, research and experience of its founder, yours truly, Simon Jackson. So if you’re thinking of coming along for some lessons you might want to learn a little more about me and how I’ve arrived at my way of teaching methods. It is these teaching methods that make learning at Express Guitar unique. I urge you to compare the extent of experience in teaching performing and research with other guitar teachers. Fully trained classroom music teacher. 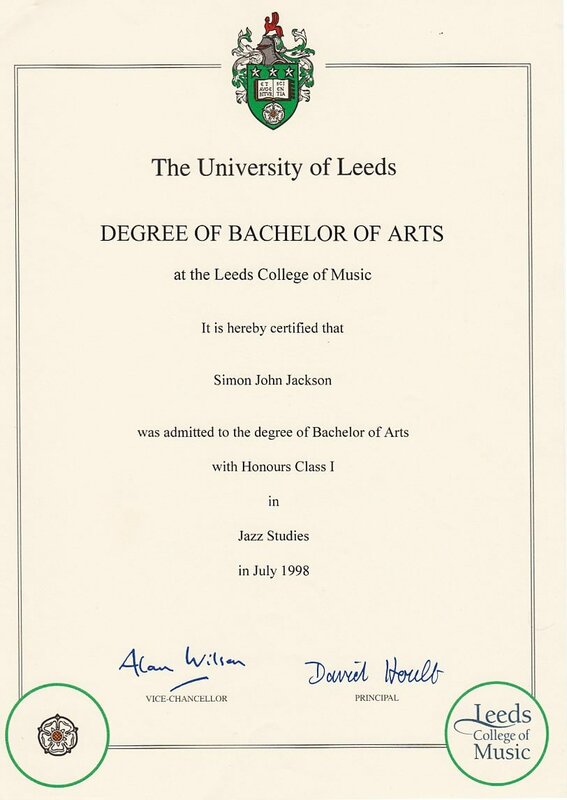 First class BA honours degree in Jazz Studies from the City of Leeds College of Music 1998. Author of a successful rock guitar tutor book. Grade 8 classical guitar 1993. I started teaching guitar privately in 1985 and have done so ever since. I teach classical, rock, jazz and folk students from beginners to professional and flamenco and most other styles of music possible on guitar up to an advanced standard. From 2004 to 2014 I was a visiting instrumental teacher at a large number of schools including Nottingham High School 2006-2014, and Trent College. At one time I was teaching at 9 schools with around 150 students a week. These ranged from year 5 students right up to A level candidates. I have also taught voice, bass guitar, violin, didgeridoo, madolin, tenor banjo, 5 string banjo, bodhran. These days I stick to the guitar as I find I have plenty to do to keep on top of all the different styles, syllabuses and so on with one instrument. I am currently an Associate Teacher at Nottingham University since Sept 2017. I did a couple of years as a visiting guitar teacher for Trent Uni from 2008. I have developed a unique syllabus of work for guitarists in any style based on the methods derived from the research I did for my dissertation and subsequently. 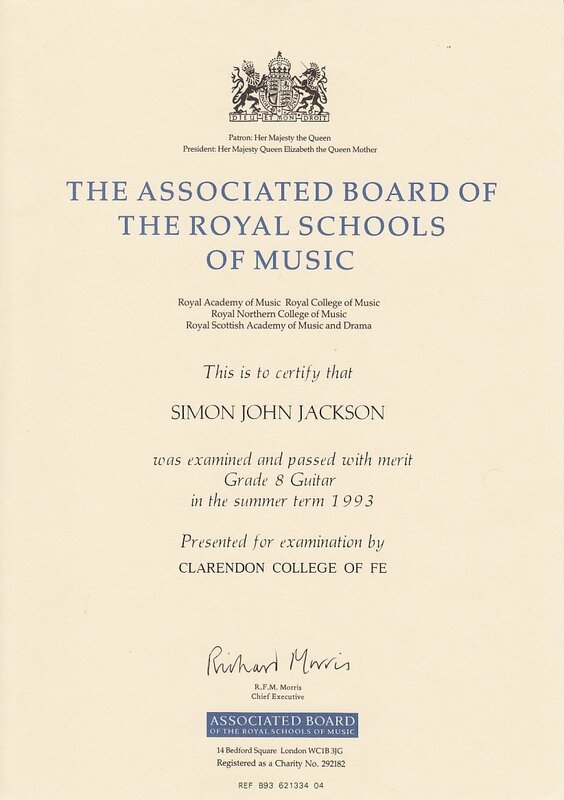 I also train students for exams with Trinity College, ABRSM, Rock School and Trinity Rock. I’m very proud of my track record of never having had a student fail an exam. Most achieve a distinction or merit. I also taught EDEXCEL AS and A2 Music Technology at Nottingham High School from 2008-2009. At Sutton Centre I taught Key stage 3 + 4 music, Edexcel AS and A2 music technology and IT. I also did lots of cover lessons for other school subjects. For eighteen months of this time I was head of music, so responsible for curriculum planning and implementation. My Ofsted inspection showed me to be an ‘excellent’ teacher. My first classroom teaching experience was in 1998 teaching 22 guitarists together for 2 hours of a Wednesday evening every week for 20 weeks. I went to Leeds College of Music hoping to get the best training in improvisation. What I found out was that little was known about how to train someone to improvise. My guitar lessons mostly dealt with the learning of a huge scale syllabus. I found myself, and those around me, making very little progress in improvisation. I switched back to classical guitar and set myself to finding out how teaching improvisation could be improved. 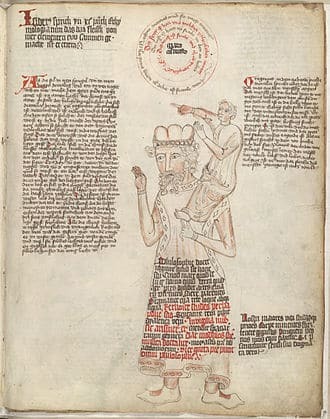 This was the subject of my dissertation (which you can read on the right). I combined studies in the fields of neurology, psychology, speech, speech acquisition, foreign language acquisition, musical analysis, jazz performance practice, and a comparison of speech and the improvisatory process. When you put all this together you realise that the way instruments have been taught can be improved on easily. Classroom teacher training showed me that very little of this information is used and I can see very little influence of this knowledge informing the teaching of the guitar in books, online lessons, even with the most noted guitar teaching coaches (to whom I have paid a lot of money!). This is where I believe my teaching is unique. My teaching is based on proper research as well as teacher training and 35 years teaching experience. I have not found any other tuition, books or videos that use the same level of understanding of music and how we learn to play it. The reason we play music is to express ourselves. Learning to play any instrument should be about learning to express yourself. My methods take you directly to that experience. No big chord or scale syllabus, just straight to the music. Luigi Palumbo – a renowned teacher at Leeds College of Music who had studied under a post graduate bursary in Italy, but I can’t find any info online about him. He transformed by right hand technique. Peter Andrews (Sydney Conservatoire) – who studied with Jose Thomas. 1989 Garcia Biberian International Summer School. It seems clear to me that guitar tuition has been going on since its invention and before that there was the vihuela, lute and oud all with long teaching traditions and books on technique etc stretching back over 3000 years. If we train with teachers who have been trained in that tradition we can know that we are building on previous learning. For a guitar teacher to be equipped to teach he should have studied with teachers who are part of the tradition of teaching. Moreover, a good teacher will question all the methods he has encountered and try to improve on them, it is not enough to accept the traidition of how things are done without questioning why. I did a brief stint as the bass player in the Scissorment playing alternative rock/punk. This came about because I was guitar buddies with Adam Lamprell who has had an illustrious recording gigging career, MTV, Roxy Music and everything. I got to play on a large stage with my long hair and general hippy look in front of a sea of skin heads supporting Bad Manners. Nerve wracking! They want on to sign to Eve Recordings. My last gigs were at a couple of venues in Italy. This included playing with Massimo Russo a wonderful gig in which Massimo played things found in the kitchen. It was funny, impressive and an honour to play with such a great musician. My performance career has included regular gigs at folk clubs, festivals and pubs up and down the country. Tangata was quite a lot to organise, so I started doing gigs with Jim Walker, just the two of us. We made an album together and played at venues from Kent to Derbyshire playing a lively mix of folk, flamenco, baltic influences. This is the performance work and CD I’m most proud of. The first job I ever had was in 1985 at Gaslights restaurant in Tonbridge Wells, Kent playing guitar in the restaurant and bar. I performed for five hours a night, five nights a week for the princely sum of £100 a week! I was bought far too many drinks. I’ve performed at a few festivals: Off The Tracks, Southwell, Towersey. I’ve played in folk clubs since about 1987. I started out with floor spots at The Pied Bull in Farningham, Kent when a friend dragged me along. Then I would play at Orpington Folk Club and the Orpington Liberal Club every week too. I ended up getting my first club bookings at the Orpington clubs and had a residency at the Liberal club for a while. I have recorded and released three full albums. Inner Pickle by Jackson Walker – a folky duo recorded at home. Kick The Bucket by Tangata featured my compositions for a folky 5 piece band. Sailing the Ice – a solo project recorded at my own studio featuring my own compositions and songs and arrangements of traditional songs with session musicians working as far away as Vancouver. I carried out all the recording, mixing and mastering for my own three albums: Tangata – Kick the Bucker, Simon Jackson – Sailing The Ice and Jackson Walker – Inner Pickle. You can hear Inner Pickle on Spotify here. As well as handling the PA for most of the bands I’ve played in I have also worked professionally as a live sound engineer at various venues around Notts, especially The Malt Cross and The Maze. I also did the sound for the acoustic stage at the 2014 Splendour festival. I have composed music for solo guitar, songs for guitar and voice, tunes for my own band Tangata (guitar, bass, fiddle, flute, percussion), a blues for jazz orchestra and even a couple of pop songs. I’ll post a few examples some time soon for perusal. In the meantime you can have a listen to some examples in the ‘recordings’ section. 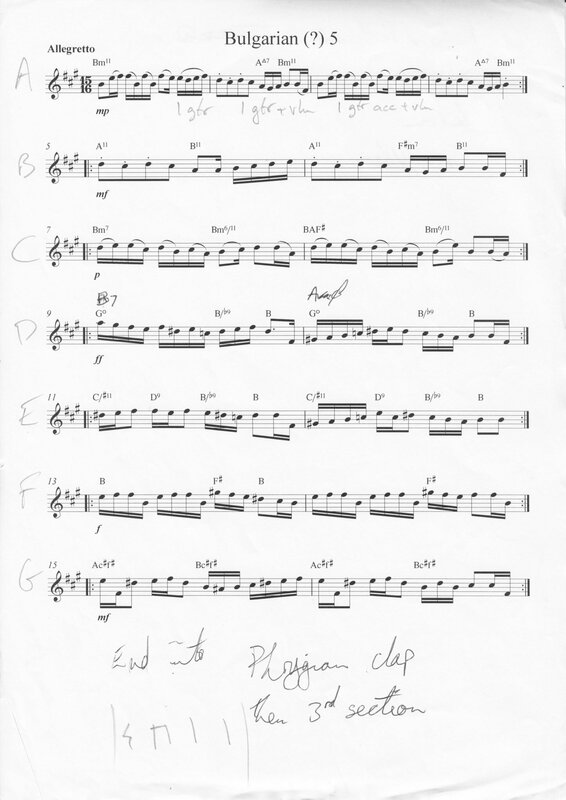 I’ve also written quite a few pieces for solo guitar. I like using alternative tunings – it helps me get away from the obvious answers. When you don’t know what any of the notes are that you’re playing you have to rely entirely on what your ear is telling you should happen next. You can no longer rely on theory or stock chord progressions and the results seem to me to be fresher and often I find things by chance that say more for me than I might have found in normal tuning. Of course using strange tunings also allows for lots of use of open strings, that’s why the tappy slappy crowd use them so much. I tend to compose for solo guitar in what could be called ‘celtic’ guitar style. Actually it’s mostly classical technique with a few flamenco techniques thrown in. I have written a successful guitar tutor book featuring around 70 newly composed studies complete with full backing tracks. I had interest from Oxford University Press but in the end did not find a publisher (yet). The pieces in there have carried many students through their GCSE music performances with high marks. On returning to the UK they then had the task of mixing, mastering and producing the album. There was a complete brass section, lots of backing vocals and a whole Cuban percussion section, plus tres and it was recording at lots of different quality levels. The job fell to me to mix and master the whole album after ‘auditioning’ alongside some top local studios. It is not until you’ve mixed and mastered a whole album that you really understand about sound engineering – I will always be grateful to Rikki, Rich and Wayne for this opportunity and for all the giggles in the studio. So, where did all this begin? What first drew me to the guitar was hearing the Concierto de Aranjuez by Rodrigo. To my shame I don’t remember who was playing on that recording. But on the right here are three great versions for you to enjoy. My mother found me listening to this piece at full blast with tears rolling down my face when I was 10 years old. I got a guitar, bought from the local toy shop for my 11th birthday and Christmas present combined. 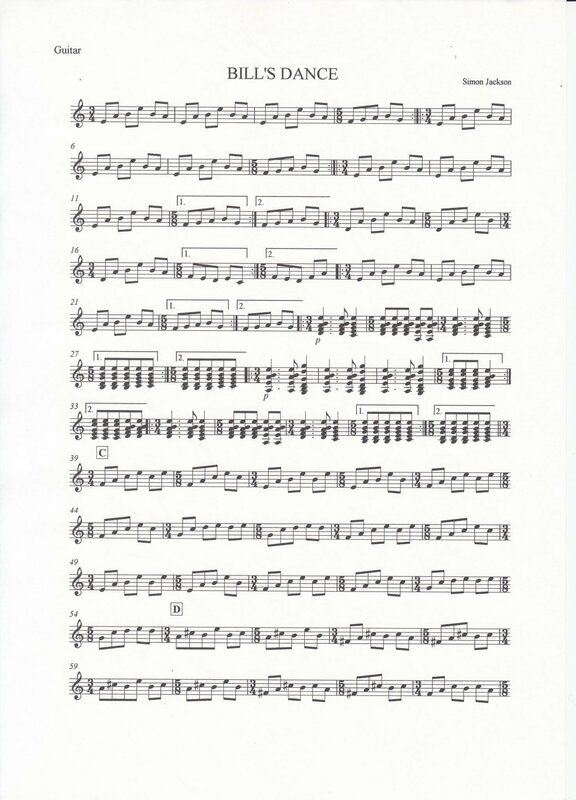 I would practise every day for hours learning to play the concierto by ear using just the thumb of my right hand (strangely focusing on the oboe solo at the start of the slow movement). I wore the 1st string out and it snapped. I didn’t know you could buy new strings, so I just used a piece of kite string, which constantly stretched out of tune and broke often. 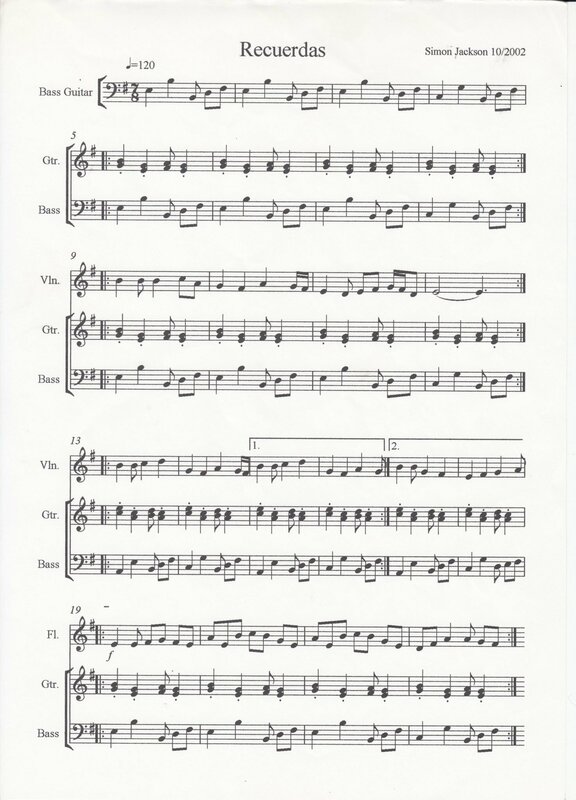 Maybe one day I’ll learn it properly and find an orchestra to play it with – but don’t hold your breath! My second study would have to be singing. From a very young age I was involved in school choirs and for a while my parents considered sending me to choir school but a family move to the US stopped that plan. Taking A-levels in music at Clarendon College involved taking part in the college operetta. While this is not really my cup of tea musically I thought ‘in for a penny, in for a pound’ and auditioned for a lead role. I got the part of Falke in the production of Der Fledermaus. This meant I got the chance to sing solos with a live orchestra in front of several hundred people every night for a week and more valuably gave me the opportunity to study voice with the renowned teacher Lynne Wayman. My first vocal training, outside of choirs and vocal ensembles, was with Gordon Farrell in 1985. He was the main vocal coach at the D’Oyly Carte and also taught Kate Bush. I also play violin (second study once I’d completed the piano requirements at Leeds), banjo, mandolin, bodhran and didgeridoo and have performed on all of these professionally. I have taught them too but these days focus purely on the guitar. You can hear these instruments on the recordings listed on this page. As well as guitar I can also play bass, mandolin, violin, banjo, drums, bodhran, didgeridoo. I have also sung the part of Dr Falke in a production of Der Fledermaus, singing with a full orchestra. I am in the process of signing up to become a Tanglewood guitars ‘artist’. I don’t have a lot of guitar equipment but I do have two custom made and quite unique guitars. This guitar was made for me by Roger Williams. 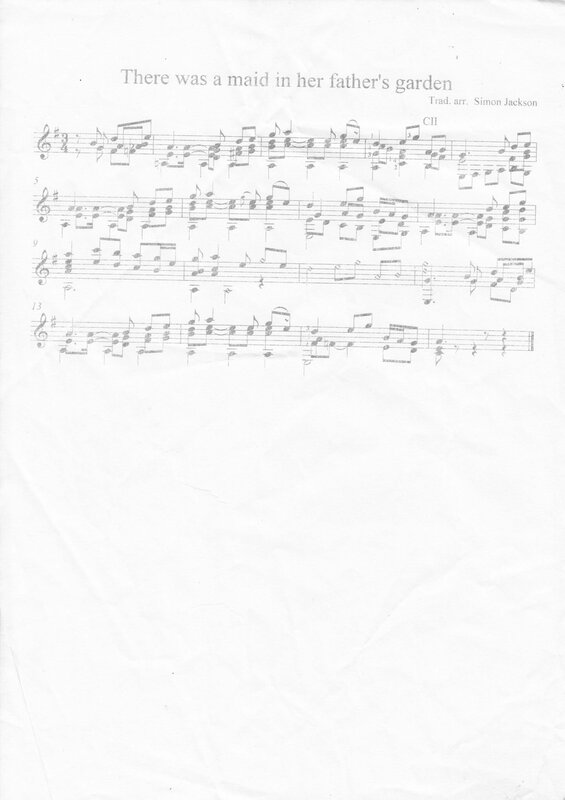 Here is a piece I wrote played on Elsa. Company Director December 2014 – November 2015 Abbey Road Music For the past year I have been in business running a guitar shop. I handled the accounts, stock management, retail, marketing and everything else associated with the business. This involved cutting deals with companies like Fender and Marshall.